A very small crowd of about 25 people at this show on this Weds night. I was really surprised at the small turn out considering Dungen brings in a couple of hundred people.. Anyway.. Dehli Metro is a pretty new band born out of the ashes of the Danish band Hjerte ka’see. 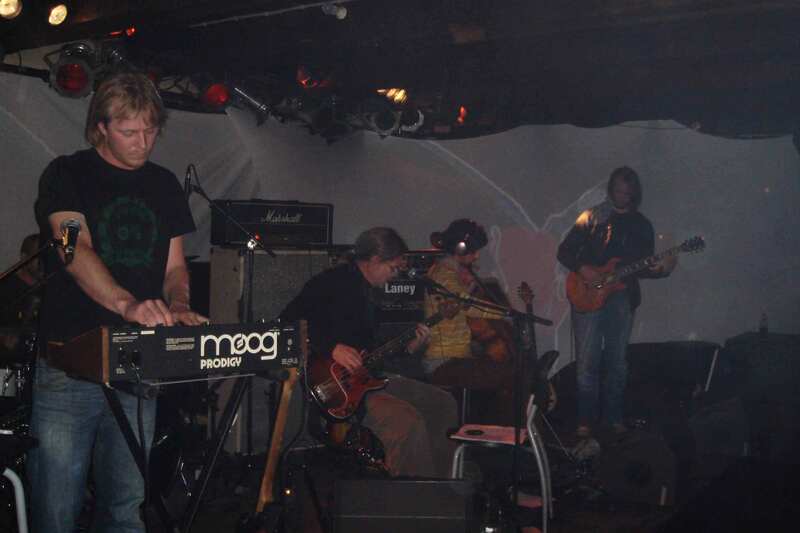 It is the poet (he also played some bass) and guitarist from that band plus Andy on cello and guitar and another guitar player who also played a Arp Oddessy as well as drums. Sebastian, the guy who used to do the spaced out lights for On Trial is now back with a full three screen, three projector multimedia set up with two Mac laptops. High tech and quite cool visuals. Same thing on all three screens. Dehli Express started off really mellow and spaced out and had some problems with the bass (not in tune). They played 7 songs in about 50 minutes and they were really cool. It is psychedelic rock with a real Alrune Rod feel to it but mix in a bit of the post rock vibe like God Speed you Black Emperor. Cool new band. It did not take that long to get Life on Earth going considering they had to take away all the gear on the stage except for one guitar and bass set up. 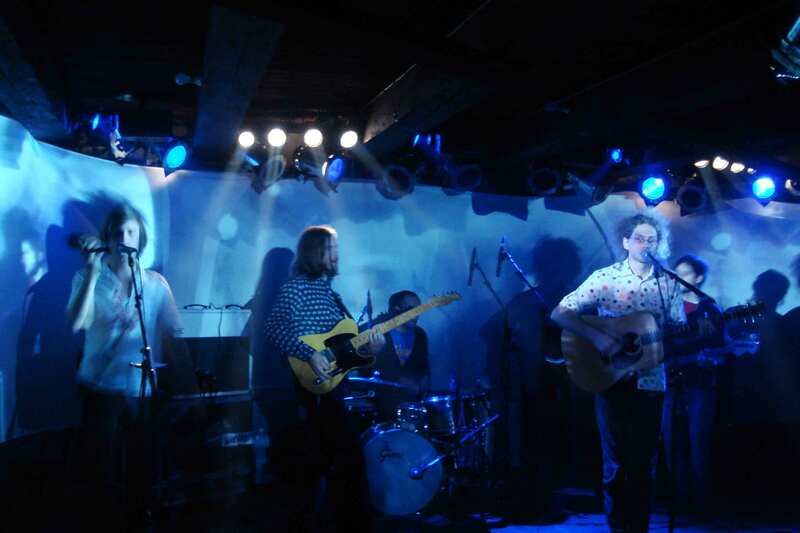 Life on Earth is a new Swedish band with members from Dungen (bass player in Dungen but lead singer and acoustic guitar in this band), The Works, and Town and Country. Anyway, they play really retro music. Some of it is a lot like old Grateful Dead and some has a more 60’s pop psych feel and then they clearly like to just freak out as well. They even did a small tease of White Rabbit by Jefferson Airplane. I really enjoyed the concert and they seemed to have a lot of fun as well. The flute player was really excellent and added a lot to the feel. I felt like they could have had more intense jams but the drummer just could not keep up and was always bringing things down too fast. The co-lead singer, he seemed pretty drunk by the end of the show, drinking beers all the time… Cool new group.. Not sure how much they will play live though as they are all in other active bands. Great to get to see them.